I would like to share with you some of my prime looking plants which I consider to fall within the areas of hybrid (Epipactis schmalhauseneii). 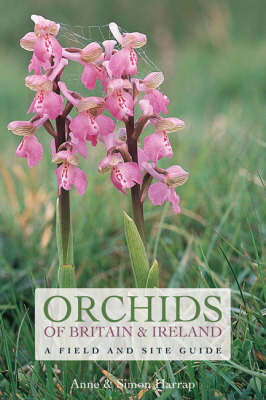 This photo above shows a typical example of how close the Epipactis relation do become. I see several examples of this throughout my exploits on Hutton Roof. In these sort of situations it is quite understable just why the two got together and in so doing can create the HYBRID Schmalhauseneii No.2 (Epipactis Schmalhauseneii). This photo shows the same plants as above, but also shows the position of Schmalhauseneii No.2. In both 2014 and 2015 the Schmalhauseneii (No.2) had suffered because of "slug" predation. In 2016 the plant never came through at all, and it has not appeared since. The mothering plants do still come through on annual basis. Yes this will I suppose always be a very special plant for me and the very first Schmalhauseneii I found back in 2012 and was given the title of Specimen 1 of which it still retains that number. 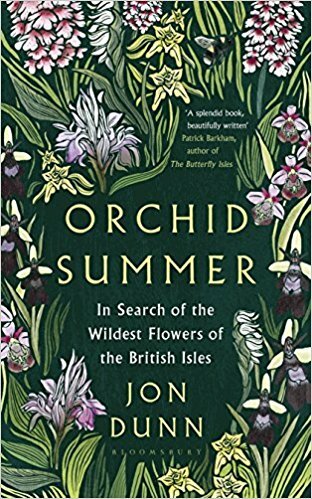 I was immediately drawn to the plant being different to the norm by being much bolder in stature, with a most impressive purple stem and a strikingly large round basal leaves to either side of the stem, also there were a staggering amount of flowers coming from all sides of the stem. You would think the specimen would be very safe with it being about 2ft down within a gryke and sheltered from all sides. But it still becomes very vunerable because these sort of areas although you may think are the best for protection from severe weathers or mammals, they can become very damp areas and as such be a attraction to slugs. Unfortunately that's what happened to this plant in both 2015 and again in 2016 it fell to slug predation. In its second year it had fewer flowers. This photo probably gives you a good idea of the very large basal leaves including a large secondary basal leaves higher up the stem. This plant did start to show a little lemon-petalled creeping in from back in 2014 and you can just see evidence of that within this plant, albeit it is only showing on the tips and outer edges of the petals. On this the first of the "bolder" specimens, you can see clearly were the fluffy bosses take up 3/4 of the width of the Epichile. The plant did come through in both 2015 and 2016 but sadly was predated during its early stages, thought to be a slug predation in both years. The plant is back with us this year (2017) with just slight damage to the basal leaf which had obviously been 50% predated in the early days, but has done OK since. So this plant to my knowledge is definately in it's fifth year. (26th August 2017) Leaf edge profiling on this specimen (denticulation) taken from the 2nd basal ascending and checked at 20x in the field and also at 40x with microscope and which now indicate a profile result of 20% Atrorubens and 80% of very irruptive profile indicating Helleborine/Hybrid influence. This is a approximate and temporary indication result only and the specimen does at some stage in the future require a secure DNA profile assessment. All specimens are collected strictly under licence from specimens which are receding growth or been subject to early predation. 2018 Did well again in 2018, I am sure it is helped by being about 18" down in a grike. I have watched it develop well since my first find back in 2012, so I guess I can confirm it is now in its sixth year to my knowledge. This was a beautiful specimen which I was privileged to find on 7th July 2014, It measured 18" in height and bore 39 flowerheads, lovely thick green stem and deeply grooved spiralling leaves, slight purple wash to 6 ridges of the ovary. Basal leaf large and edged in purple. Epichile median at 19mm wide with median boss widths of approx 12mm wide. Boss to epichile 62%. Boss bold and very frilly, Stem from ovary to stalk washed purple. 2015 report - Plant doing well on 11th July, and by the 17th July the plant looked very poorly and had been invaded by Black Aphids (see photo below). You sadly witness all life being sucked from the plant with the invading "Black Aphids" and also you witness large black ants which are obviously farming the aphids for their milk. Obviously that year the plant died prematurely. 2016 Report - I first checked out the plant on 25th June and it was noted that the plant had been cut and would not do anything. Interestingly a stone surround cage had been built around this plant which gave it a tight protection and because of this you would not think of a hare being the predator so could only presume perhaps a slug had been responsible, although no slug was anywhere near the plant. Just maybe somehow the plant had a "harecut". This photo shows a close up of Spec 8 taken in 2014 (photo: Bryan Yorke) Click over to enlarge. I have shown this leaf and stalk close up photo of Specimen No.8 (Schmalhauseneii) here because if you look at the photo earlier of the plant other than the actual flowers you could be forgiven for thinking there is no red showing on the plant its all green (= helleborine). But that is not the case you will always find some "red" somewhere especially when you look to the areas where the leaf joins the stem and also at lower areas of the stem may show signs of "red" just like we have here. Also worth noting from this particular photo is you can almost see the "teeth" on the leaf margins without microscope and a point maybe worth noting is that the "teeth" look as though they could be transparent. Remember here we are looking at the leaf structure of a "hybrid" and not a atrorubens, although the flower is a "bold atrorubens" and the timing of the plant coincides exactly with early atrorubens. 2018 It was great to see Schmal No.8 back with us after all its problems since 2014 with aphid predation and then the slug predation etc. But thankfully its looking like it has persevered although slightly stunted and weakened it is doing OK. Just look at the light green in this specimen and look at the photos prior to this which show the plant in its former glory. And yet with so much light green in the stem make up you will also note that the "red" is showing clearly on the lower stem which is the usual case with thise specimens (3rd July 2018). Sadly a few days later (7th July 2018) the plant went down yet again, but this time with severe dehydration. 2014 I can still remember receiving a phone call back on the 6th July 2014 alerting me to these two majestic offerings which flowered in close company of several other Schmalhausenii together with numerous variants etc. I guess the area was a "hot spot", and that's exactly how it remains today. These two plants in particular were striking because I had never seen a pair of schmalhauseneii (or atrorubens for that matter) that had this type of colouring with the light features throughout - the light green stood out with the ovary, the bracts against a light green stem and leaves. The only atrorubens make up on view was the flower itself which had pink coloured petals and sepals. No.9 had 40 flowers and No.10 (on its right) had an amazing 50 flowers. No.10 the tallest of the two stands at 21 3/4" whereby No.9 the smaller of the two on the left stands at 20". Further measurements I got for No.10 was the Epichile width was 12-15mm, and Boss width 9mm. Yet another interesting fact about hybrids is that in the majority of cases they will be paired just like these specimens. In 2015 an attempt was made and No.10 actually produced an immature plume, but then showed signs of the plume cut and left dangling. The specimens had been caged and it was presumed that the predator may well have been slugs. In 2016 one of the plants failed although one of the plants came through OK but in a much reduced size. I can't say that I have ever seen any plants either pre or since that which bear that distinctive colouring as these two, without doubt a ONE OFF! Although after saying that I have in 2016 found several in the very close proximity (lets say 15 to 20 ft) of that very light specimen, that do bear a strong resemblance although much smaller delicate plants. This resemblance is not seen on any other plants outside of the area in question. So I do have a strong feeling that these particular plants could well be the "offspring" of 9 and 10. I will be able to show you a photo of suspected offspring eg: 9a etc very soon. This is Specimen 9a (Schmalhauseneii) which I consider maybe a offspring to No.9/10 shown above. A leaf sample has been collected (under permit) and it is hoped that soon we may even have a DNA trail. On this specimen please note the "bent green stem" appearance, this is particularly noticeable on so many "possible schmalhauseneii" or plants that have bred back maybe. I will certainly discuss these points later. (26th August 2017) Leaf edge profiling on this specimen (denticulation)checked at 20x in the field and also at 40x with microscope and which now indicate a profile result of 40% Atrorubens and 60% of very irruptive profile indicating Helleborine/Hybrid influence. This is a approximate and temporary indication result only and the specimen does at some stage in the future require a secure DNA profile assessment. All specimens are collected strictly under licence from specimens which are receding growth or been subject to early predation. The area is still good today (2016) yet the layout has changed considerabily eg: You can see in the centre right Specimens 9 and 10 (light phase). Today only one of the plant survives in this area and that plant is only about half the size of how it shows in this photo. To the left of the photo are the more colourful Specimens 11 and 12 and another (unamed). In 2016 these plants are not in this position but have moved slightly to their left of this photograph. I can recognize these plants family trait from the photo I will show now from 2014 and the follow up photo from 2016. Specimen 11 was first noted back in 2014 and has always been one of our more bolder and taller of hybrid specimens and always came up close to another and thought possibly to be of the same rhizone (11a and shown lower down). 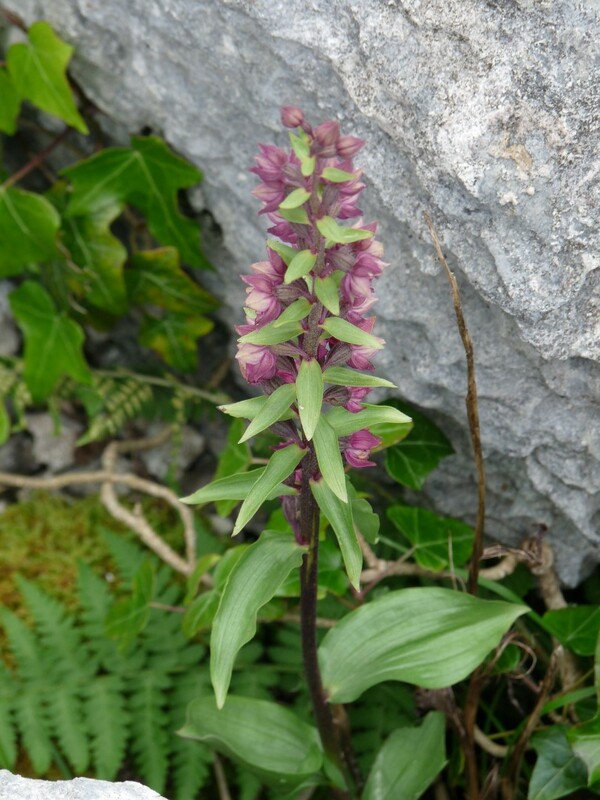 It is immediately striking with its light green features especially in regard to it's stem and also to it's height, you straightaway give claim to E. Helleborine features. Closeby to Specimen 11 is also No.11b which was caged in 2016 and 2017 - see below. It is thought that maybe this specimen relates from 11. Also if do have another which is thought to be a close relation and named 11c which is actually about 100 yards North of 11 and this plant looks very much like it could well have come from the same stock. A photo will be included shortly. Leaf edge profiling on this specimen (11) (denticulation) taken from the true basal and secondary basal ascending and checked at 20x in the field and also rechecked at 40x with microscope and which now indicate a profile result of 80% Atrrubens and 20% of very irruptive profile indicating Helleborine/Hybrid influence. This is a approximate and temporary indication result only and the specimen does at some stage in the future require a secure DNA profile assessment. All specimens are collected strictly under licence from specimens which are receding growth or been subject to early predation. Specimen came through OK and stands very tall. Sadly yet again the specimen was predated with the plume being removed before it managed to get into full bloom. The specimen is large and stands at around a metre tall. This plant stands right at the side of No.11 and could well be a duo. I have checked the plant since 2014 and always suspected a duo but never been able to confirm. Leaf edge profiling on this specimen (11a) (denticulation) taken from the true basal (39mm x 27mm) and secondary basal ascending and checked at 20x in the field and also rechecked at 40x with microscope and which now indicate a profile result of 20% Atrrubens and 80% of very irruptive profile indicating Helleborine/Hybrid influence, also lots of purple staining to underside of true basal. This is a approximate and temporary indication result only and the specimen does at some stage in the future require a secure DNA profile assessment. All specimens are collected strictly under licence from specimens which are receding growth or been subject to early predation. We do have this one currently caged and its within striking distance of where 9,10,11,12 and their offspring take residence so its more than likely to be from that family mould. It is a striking plant as you can see here. It was getting a little late when I took the photo on 19th July and thats why you see the slight burnt edges. It is thought to have hybrid potential and directly related to 11 and subsequently this plant should now be called 11b. 2017 - Plant first discovered about 100 yards NW of Specimen 11 - sadly the plant was took down by Roe Deer only days after this photograph. 2014 - Shown at its very best! Make the most of them! because they will never ever look the same the following year. Lovely "keeled" leaf examples and probably the best of all the larger schmals. In 2015 the plants had just reached the stage where the plumes were straightening out (see above) and sadly at that stage a Brown Hare decided to give them a "Harecut". I wouldnt have minded so much if he had actually eaten the plants, but no just bit them and left one of them dangling as you can see in the photo. In 2016 No. 15 did come through (see photo below), although No.16 (now 15a) just remained a stump. No. 15 was not as good a looking as in 2014 (photo above) but seemed to always look a little dried out especially in the leaf lower section and also the flower colours were also much weaker or would it be that they are turning to show the "Lemon Petalled" phenomenem. I will show a photo below so you can see the difference for yourself. 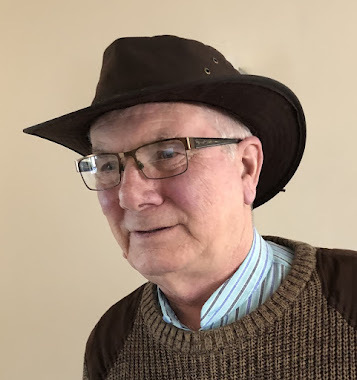 Obviously if this be the case then it will only make everything that little more complicated because up to now, we have not had interference within a Schmal with the Lemon Petalled, this so far has been purely associated with atrorubens variety only and not until now associated with hybrid! but is all this about to change? Under permit leaf samples have been collected and sent off for further investigation. that beautiful keeled example which you could see back in the 2014 specimens. This was a nice surprise to find a additional plant coming through with Schmalhauseneii No's 15 and 15a so lets hope if makes it to be 15b. I have noted already that the plants have been predated probably by slugs which seem to have been nibbling the edges of the leaves on 15 and 15a. I did check around the plants but could not find the culprit. 2017 - Sadly the plants were predated yet again before flowering. This beauty came through in 2017, and proved to be a record by having no less than 62 flowers or buds which went all around the stem. The plant lies approx 20 yards from what I believe will be its parentage of Specimens 15,15a. The plant was 15 1/2" tall with a thick purple stem. It lies 5ft from a large Juniper bush. The plant first flowered on 29th June and was taken down by a Brown Hare on 6th July 2017. It is my intention to try and cage this plant in readiness for the 2018 season. The area which I call "17" is approximately (150ft long x 40ft wide) and sort of partially enclosed with canopy of Hazels and rowan and ash on one side and bracken fern on the other side. It produces some fine specimens of both Atrorubens and Helleborines alike, and also I do have up to 20 suspected atrorubens led "hybrids". The last count I did of area 17 about one month ago (July 2017) I managed to count over 80 Atrorubens (or in part atrorubens led suspected hybrids) and approx 10 x E. Helleborines. It is really surprising how these little pockets of areas are so individual in their own particular make-up and the local plants can in some cases be so different to every else on the same Fell. I guess the main feature of area "17" and a feature replicated in part on "Escarp" are most of the suspected hybrids which are mainly of intermediate size and number approx 20 (numbered 17a,17b,17c and so on until you get to 17v). 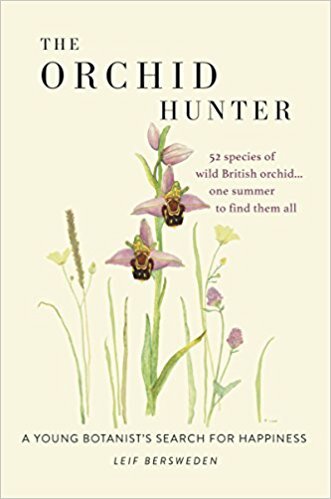 The majority of these have a lovely atroruben flowers but have good strong "Helleborine" leaf profiles, usually starting with "dish shaped large basal leaves and then going into the larger "Broad but Lancelate type leaves" which give you the impression they are at least holding some "hybridization features". In the main the majority of the specimens are the "regular" magenta type colouring, and the area at present has only one of the lemon-petalled (lempet) specimens which it seems is not influencing any of the other plants at the moment. Although there is a lovely specimen No.17 which is very pale with a good strong "light green" stem. Also very special this year (and originally found by Pauline Mellor-Greenhalgh) are a lovely light coloured (unusual unique coloured) trio coming up from the same rhizome and these little beauties are called specimens 17d,17e,17f, besides having a very light green stem have brown coloured ovaries and also their epichiles and bosses are of a cream colour. They are just less than intermediate in height (approx 15" to 18") and well stocked with flowers clinging to three sides of their stem. on some of the 17s plus others. So far it has been very interesting although the outcome is very similar to my sneak previews with my 20x glass. These are some of the results after checking through at 40x. The two large E,. Helleborines which are just in front of the 17 area and lie within spitting distance to most of the "17" hybrids are showing at 100% true E.Helliborine profile as you would expect. This leaf sample profile will eventually be used for dna profiling as a probable "parent" in the hybrid mixes of the 17s. Now moving on to 17d,17e and 17f trio from the same rhizome shows a result of 80% atrorubens/mixed with a 20% highly irruptive probable hybrid profile (probable hybrid result as previously expected). Moving on now to 17k (the 2nd large Basal) 75% Atroruben profile with 25% high irruptive hybrid profile (probable hybrid result as previously expected).17n (the 2nd large Basal) 75% atrorubens profile with 25% very irruptive profile of helleborine or hybrid, no traces of red flush staining. (probable hybrid result as previously expected), 17q (taken from 2nd large Basal) shows 30% atrorubens profile with 70% very irruptive hybrid profile (probable hybrid result as previously expected). This one came as a complete shock and relates to Lempet-ella No. 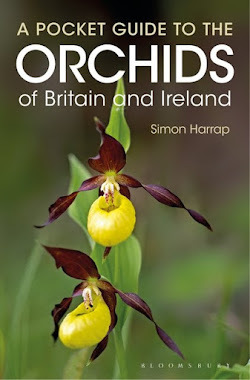 1 (thats the one that is helleborine flower with the lemon- petalled flowers and that came up 30% atrorubens and 70% irruptive helleborine or hybrid profile - so it really looks like there could well be a mix here with the helleborine - who knows? Others include Specimen 33 80% irruptive hybrid profiles against a 20% Atroruben profile (probable hybrid result as previously expected). Small 10" 33f light green specimen 90% atroruben against 10% highly irruptive hybrid profiles. No.55k (a Lempet Duo) 90% Atroruben with a highly irruptive hybrid profile - also red flush staining. Now moving on to "Albiflora variant" Complete 100% Atrorubens profile as expected. 55j Lempet behind Albiflora is 95% atrorubens 10% highly irruptive. A very strong helleborine that lies just a metre behind 40,40a and shows "purpurea" is remarkable with 20% atrorubens, against 80% helleborine - I do suspect this one somewhere along the line is tied in with 40,40a. But flower and general look takes you in the helleborine direction (so the 20% atrorubens comes as a shock) 40,40a shows 90% atrorubens profile against a 10% irruptive helleborine or hybrid profile. Now then this one is interesting No.74 Lempet, shows highly irruptive profile to 90% and with 10% to atrorubens and finally for today Escarp 13 (Lempet-Bold) is 50% atrorubens and 50% high irruptive with no red flush staining. This is a very special specimen which has a very light green stem and a slightly differing colour of flowers to the norm, they do include a more "brownier" look that the regular. Leaf edge profiling on specimen 17 (denticulation) taken from a ascending true leaf checked both in the field at 20x and also rechecked at 40x with microscope and which now indicates a profile result of 60% Atrorubens and 40% of very irruptive profile indicating Helleborine/Hybrid influence. This is a approximate and temporary indication result only and the specimen does at some stage in the future require a secure DNA profile assessment. All specimens are collected strictly under licence from specimens which are receding growth or been subject to early predation. This is 17b which shows just at the gateway to the 17 area. It is a little beauty standing at around the 16" height, with a mid to dark green stem and purple ovaries, with two tone purple flowers. The large leaves are folded and grip the stem as opposites. (26th August 2017) Leaf edge profiling on this specimen (denticulation) checked at 20x in the field and also at 40x with microscope and which now indicate a profile result of 30% Atrorubens and 70% of very irruptive profile indicating Helleborine/Hybrid influence. This is a approximate and temporary indication result only and the specimen does at some stage in the future require a secure DNA profile assessment. All specimens are collected strictly under licence from specimens which are receding growth or been subject to early predation. This is a beautiful plant (17c)which is just at the entry into the 17 Cul de Sac. It has a lovely light green stem and typical flower colourings to the majority of the 17s. The trio are from the same rhizome rootstock and do have a unique colourization which is obvious on first viewing. The plants are of a intermediate size in the 12",14" and 16" range. The stems of the plant are very light green. They have striking creamy coloured epichile and bosses (see photo below) and another unusual factor is represented by the striking brown ovaries. The plant came through well and was first found by Pauline Mellor Greenhalgh in 2017. Sadly the trio fell victim to deer predation before they got chance to seed off. The denticulation profile show as: 80% atrorubens - 20% high irruptive to helleborine/hybrid. I can only ever say that I have seen this particular colouring in part was from the original bold specimens Nos: 9 and 10 (found in 2014) of which now the originals have disappeared and did hold territory at about 250 yards to the SE of this particular trio. (23rd June 2018) All three have come through but only two of them are flowering 17f has not grown a flowerhead - now caged for protection. (20th August 2017) Leaf edge profiling on specimen 17k (denticulation) taken from a secondary basal ascending, and checked both in the field at 20x and also rechecked at 40x with microscope and which now indicates a profile result of 75% Atrorubens and 25% of very irruptive profile indicating Helleborine/Hybrid influence. This is a approximate and temporary indication result only and the specimen does at some stage in the future require a secure DNA profile assessment. All specimens are collected strictly under licence from specimens which are receding growth or been subject to early predation. (26th August 2017) Leaf edge profiling on this specimen (17n) (denticulation) taken from the true basal ascending 50mm x47mm) and checked at 20x in the field and also rechecked at 40x with microscope and which now indicate a profile result of 40% Atrorubens and 60% of very irruptive profile indicating Helleborine/Hybrid influence. Purple staining to teeth base and also to underside of leaf, edges and strong at stalk to sheath coupling. This is a approximate and temporary indication result only and the specimen does at some stage in the future require a secure DNA profile assessment. All specimens are collected strictly under licence from specimens which are receding growth or been subject to early predation. (26th August 2017) Leaf edge profiling on specimen 17o (denticulation) taken from a true basal ascending and measuring 38mm x 36mmW and checked both in the field at 20x and also rechecked at 40x with microscope and which now indicates a profile result of 25% Atrorubens and 75% of very irruptive profile indicating Helleborine/Hybrid influence. Purple staining to teeth base and also to underside of leaf, edges and strong at stalk to sheath coupling. This is a approximate and temporary indication result only and the specimen does at some stage in the future require a secure DNA profile assessment. All specimens are collected strictly under licence from specimens which are receding growth or been subject to early predation. (26th August 2017) Leaf edge profiling on specimen 17p (denticulation) taken from a secondary basal ascending, and checked both in the field at 20x and also rechecked at 40x with microscope and which now indicates a profile result of 20% Atrorubens and 80% of very irruptive profile indicating Helleborine/Hybrid influence. This is a approximate and temporary indication result only and the specimen does at some stage in the future require a secure DNA profile assessment. All specimens are collected strictly under licence from specimens which are receding growth or been subject to early predation. (20th August 2017) Leaf edge profiling on specimen 17q (denticulation) taken from a secondary basal ascending, and checked both in the field at 20x and also rechecked at 40x with microscope and which now indicates a profile result of 30% Atrorubens and 70% of very irruptive profile indicating Helleborine/Hybrid influence. This is a approximate and temporary indication result only and the specimen does at some stage in the future require a secure DNA profile assessment. All specimens are collected strictly under licence from specimens which are receding growth or been subject to early predation. This is the beautiful Specimen 20 which hides almost under a Hazel bush canopy. And is the latest of the flowering atroruben led plants. It has a light green stem and very light ovaries with a good duel purple coloured flower. The stem of the plant is very bendy, but this is seen within several of the suspected hybrids. to the bottom lip is still prevalent and also possibly another indicator to "helleborine"
This is a very strong specimen at the base of a small hazel bush. All around it are more nice specimens which some could well be related to 33. It is clear that the specimen does have Lem-pet qualification and also of interest is that the Epichile and bosses are very light and almost to a white (prior to 2018). (23rd June 2018) Photos taken and noted this year that the cream epichile and bosses have now bred out as you can and replaced with a more defined pinkish colour, yet the apple green colour tip to the tip of the epichile remains. This is a lovely small 10" specimen with a very light lemony green stem and is approx 4ft NW of specimen 33 hybrid. (20th August 2017) Leaf edge profiling on specimen 33f (denticulation) and checked both in the field at 20x and also rechecked at 40x with microscope and which now indicates a profile result of 90% Atrorubens and 10% Helleborine/Hybrid irruption profile. This is a approximate and temporary indication result only and the specimen does at some stage in the future require a secure DNA profile assessment. All specimens are collected strictly under licence from specimens which are receding growth or been subject to early predation. (June 2018) caged but suspected "stunted" growth due to drought weather conditions - all OK on 23rd June. (20th August 2017) Leaf edge profiling on specimen 40,40a (duo) (denticulation) and checked both in the field at 20x and also rechecked at 40x with microscope and which now indicates a profile result of 90% Atrorubens and 10% of very irruptive profile indicating Helleborine/Hybrid influence. This is a approximate and temporary indication result only and the specimen does at some stage in the future require a secure DNA profile assessment. All specimens are collected strictly under licence from specimens which are receding growth or been subject to early predation. (26th August 2017) Leaf edge profiling on specimen 69 (denticulation) taken from a third basal ascending, and checked both in the field at 20x and also rechecked at 40x with microscope and which now indicates a profile result of 10% Atrorubens and 90% of very irruptive profile indicating Helleborine/Hybrid influence. This is a approximate and temporary indication result only and the specimen does at some stage in the future require a secure DNA profile assessment. All specimens are collected strictly under licence from specimens which are receding growth or been subject to early predation. This plant is very colourful which stands out a lot. Again we have similarity in colour from Specimen 8 and also from 11 and 11a and it would not surprise me if these were related! This plant is far (approx 200 yards West) to the others which would be just right for normal prevailing wind flow I guess! This specimen has been added this year (2016) and comes from a area which has lots of interesting plants growing all around both atrorubens and lovely helleborine specimens so close together and it really does look like some mixture is about here, not just with this one (Spec 70) but lots of plants in the area. Also of interest the same area lends itself to two really nice purpurea helleborine specimens. (26th August 2017) Leaf edge profiling on specimen 70 (denticulation) and checked both in the field at 20x and also rechecked at 40x with microscope and which now indicates a profile result of 40% Atrorubens and 60% of very irruptive profile indicating Helleborine/Hybrid influence. This is a approximate and temporary indication result only and the specimen does at some stage in the future require a secure DNA profile assessment. All specimens are collected strictly under licence from specimens which are receding growth or been subject to early predation. (2017) This plant (70) came through as a duo (70,70a) with the same colourization and build. Unfortunately just after flowering the plants fell victim of the Roe Deer and had their spike removed. (26th August 2017) Leaf edge profiling on specimen 73(denticulation) taken from the third basal ascending, and checked both in the field at 20x and also rechecked at 40x with microscope and which now indicates a profile result of 20% Atrorubens and 80% of very irruptive profile indicating Helleborine/Hybrid influence. This is a approximate and temporary indication result only and the specimen does at some stage in the future require a secure DNA profile assessment. All specimens are collected strictly under licence from specimens which are receding growth or been subject to early predation. This is a beautiful little plant which only stands at about 10" high shows clear signs of lemon-petalled features and it was only discovered in 2017 although I had checked out Specimen 73 many times. Within one metre lies a large hybrid Specimen 73 and also another small specimen called 73b. It is striking with its very pale hypochile, epichile and bosses features. See the close up photo next. This is a beautiful little plant which grows down in a shallow grike. Only discovered in 2017 it is approx one metre away from 73 a tall hybrid and less than one metre away from the lovely 73a another small specimen. Today (14th August 2017) I have decided to do some home study on Specimen 74 (lemon-petalled). I did go and check it out in the field only yesterday and the ovarys are very slow at swelling on this specimen, but what stood out a mile was the lower leaf structure which did have very dishy basal leaves which straightaway gives me the impression of "helleborine part" influence. The denticulation pattern takes on "hybrid" with a clear atroruben/helleborine mix pattern clear to see. This was observed yesterday whilst in the field (under 20x), but today I intend to put the sample (collected under licence) under 40x to try and get a better conclusion. After checking the specimen at 40x its quite clear that the results are just what I expected on yesterday's brief check out. The majority of the profile line is irruptive and represents itself at 90% hybrid/helleborine and only 10% of Atrorubens. The denticulation profiles are transparent throughout with no trace that can be recognized of any "red flush". (I have suspected for quite a while that at least the bolder lempets where not simply another variety but more than likely to be yet another mix within the hybridization quandry! and this guide only strengthens that opinion, although these denticulation measurements can alter greatly between Lempet and Lempet. 2018 (Thursday 21st June 2018) The above photo shows Specimen 74 where the plant should have been showing in full maturity eg 18" tall, but this year which just never made it. It remained at that stunted level throughout and dieback. Again another culprit of the severe dehydration this year. Today (16th August 2017) I decided to do some checking on what I call "ESCARP 12" (the reason some are called escarpment is purely the area on the Fell is just at the drop of yet another level. I have watched this plant now for some four years and it always has lovely "deep magenta" coloured flowers with no hint of (lempet) although lempet do grow within 10 yards of the plant. It comes up through close cover of nearby Hazel shrub. To it's left hand side of the plant there is a secondary plant (Escarp 11) which holds very similar colours and build to Escarp 12 and I would have no hesitation in thinking that they are from the same family, although 12 is slightly taller of a plant. I do suspect that there is a limited amount of hybridization (E. Schamalhauseneii) within this plant. Probably the first suspicion is gained through the broad dish shaped "helleborine" type leaves. Also the flowers do have a "around the stem" look to them. A very bold strong "purple" stem. I have today checked the denticulation pattern on one of the basal leafs (leaf removed under licence) and it was just still fresh enough to be able to establish that the teeth patterns at (x40) are varied and represented in three separate ways eg: areas of straight atrorubens pattern (the majority), also areas of a distinct helleborine pattern with the odd raised tooth every 1/2" or so (linear), and some areas made up of a mixture between what you would call a atrorubens and helleborine mix profile. It is of interest to me that several of the specimens show up this way with a split profile rather than one single profile taking over the complete leaf. Also I did manage to note that the "atroruben red flush" was showing in part to the base of the toothline. 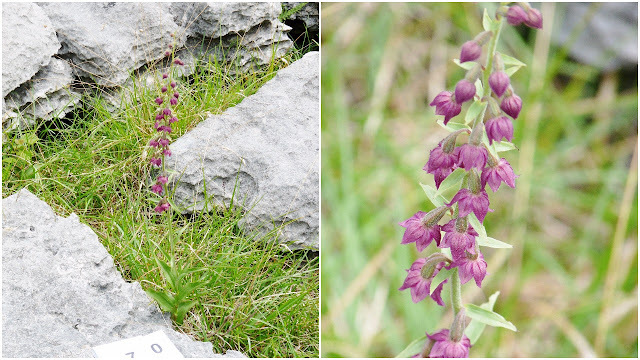 So I guess with such strong magenta flowers, together with the strong purple coloured "thick" stem and the denticulation footprint of the profile (atroruben majority) together with the "red flush" that the plant may be considered for hybridization with a probable "Atroruben (lead) Helleborine (secondary) mix. Unfortunately the collected leaves are generally OK only for a very limited period for leaf edge profiling, although the sample will I hope be very useful eventually for DNA profiling. Leaf edge profiling on this specimen (Escarp 13) (denticulation) and checked at 20x in the field and also rechecked at 40x with microscope and which now indicate a profile result of 50% Atrrubens and 50% of very irruptive profile indicating Helleborine/Hybrid influence. This is a approximate and temporary indication result only and the specimen does at some stage in the future require a secure DNA profile assessment. All specimens are collected strictly under licence from specimens which are receding growth or been subject to early predation. 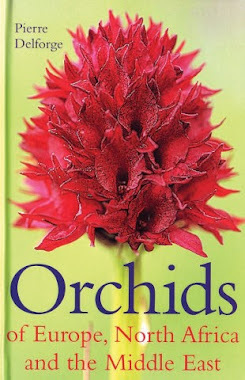 I have noted these with much frequency whilst going around checking out plants. In some instances they are so colourful with green stems and lovely coloured flowers to contrast (see specimen 4 below) and in other cases they will take on a more buff coloured appearance (like No 9a below). Some of these plants like Spec 4 cannot afford to be handled (under permit). They seem to be so weak that handling does have an immediate detrimental effect on the plant. The plants colours and appearances and make up do tend to lead you down the "Schmalhausenii" road which probably is the correct road, although I cannot help but wonder if some of these are actually F1 plants that have bred back on themselves, and this I presume would then possibly create a very weakened strain especially in its infancy. We have already just spoken earlier about 9a which I show again here so you can observe the curve in the stem etc. Usually by the following year the stem will have straightened. What is of great interest is that when I have been privileged to see a BOLD hybrid at its very best, the follow on years it does not seem to come through as good. In fact from the ones I have been recording so far they seem to be in a lesser or far worse shape in subsequent follow on years eg: coming through far more stunted or smaller specimens recorded in most cases, but not all. The majority seem to have a one off "Glory year". On several of the bold specimens on reaching their fourth year they have then not come through on the following year (the fifth year, or that was the case in 2016)) and these plants disappeared without trace! Its as though all the goodness has been put into those early years growths and nothing is left for the follow on years. After saying that I do have odd specimens which have already gone through their fifth year barrier and hopefully will show again this year (2017). Also as yet I am not sure what the situation is with ordinary atrorubens whether they also take on this same outcome, it will be interesting to find out!